HIGH RIVER, ALTA. – Perspective is everything. Paul Morrison, dealer principal of High River Ford, said that if you had asked him last year how he would feel if a wild summer hailstorm damaged every car on his lot, he would have said very bad. High River, the small town of roughly 13,000 located in southwestern Alberta, was one of the area’s hardest hit by the record flooding that made headlines across the country in June. Almost the entire community was evacuated and a state of emergency remained in effect for nearly four weeks. More than a month later, many townspeople remain in residential limbo not knowing if the disaster relief teams and provincial boards will deem their homes fit for occupation ever again. And while construction and contingency operations forge ahead, the town was nailed by an intense hailstorm on July 23 that broke windows and dented nearly every car on the lots of at least two dealerships. 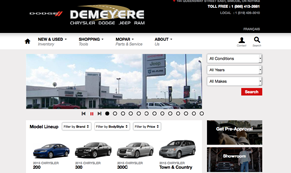 “It was like adding insult to injury,” said Dave Jackson after surveying the damage at his Country Chrysler store. 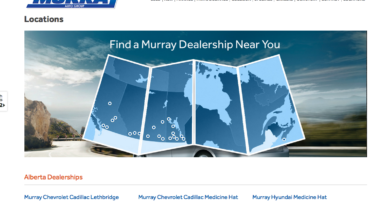 The town’s southern end that runs along 12 Avenue SE is home to four franchise dealerships including Morrison’s Ford store, High River Toyota, High Country Chevrolet and nearby Country Chrysler. 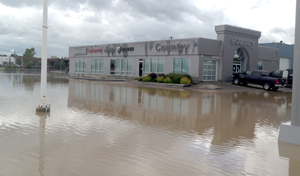 Though none of the buildings sustained any damage during the June floods, Jackson said water came within inches of entering his dealership. The general manager and co-owner said he and a partner moved roughly 140 vehicles to higher ground on June 20 when the floodwaters were approaching. By the next day, several feet of water sat on his lot. “It came as close as it could possibly could come without damaging the building,” he said, noting that resulting sinkholes and pavement shifting from the water have left him with a $65,000 repair bill. Morrison said he was watching the news and scanning overhead shots for any hint on the fate of his dealership. The store had been recently imaged and he started thinking about the possible damage while he waited. He managed to get to the store a few days later and said they didn’t even have mud on the lot. The big problem for dealerships, Jackson said, was getting back to business. All of the stores were closed for more than a week and, when they did reopen, Internet and phone services were down. Aside from logistics, employees were dealing with serious issues of their own while trying to juggle the demands from customers whose cars had been written off. Both men said they saw sales spikes in July as the rush of insurance customers came back needing a replacement vehicle. If that strength will be sustained for the long run remains to be seen. The Ford and Chrysler stores also lent vehicles to emergency personnel in the days and weeks following the flooding. Add the hail damage to the mix and it has been one hell of a summer, he added.